Screening as part of the exhibition From War to Remembrance: A Living History of the RSL, The Rats of Tobruk is a hard-hitting film being shown as one of a series of activities to help celebrate the formation, purpose and activities of the Returned and Services League in Western Australia. Directed by Charles Chauvel and first released in 1944, the Australian film tells the tale of the grim, dusty, desperate siege of Tobruk in Libya in 1941, during which a combined force of British, Indian and Australian troops held off Rommel’s Afrika Korps for eight months. Told from the viewpoint of men in foxholes and dugouts, it has been described as a film that explores the truths about wars. The film stars Peter Finch, Chips Rafferty, and Grant Taylor. 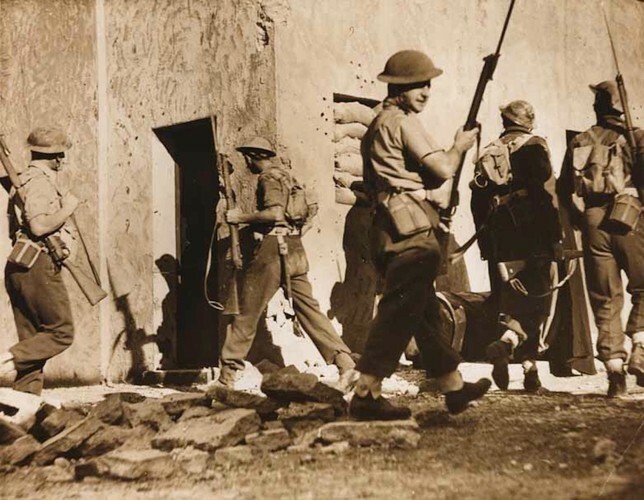 The Rats of Tobruk is being screened courtesy of the National Film and Sounds Archive and is part of an on-going programme at the State Library of WA. The film is being screened in the State Library Theatre at the State Library of WA. The film screening is one element of the From War to Remembrance exhibition (20 April to 30 June) which includes a handcrafted art installation by artists Smash Creation, interactive displays and a selection of objects collected from the RSL’s 132 WA branches, most being featured for the first time. Image courtesy of the National Film and Sound Archive.